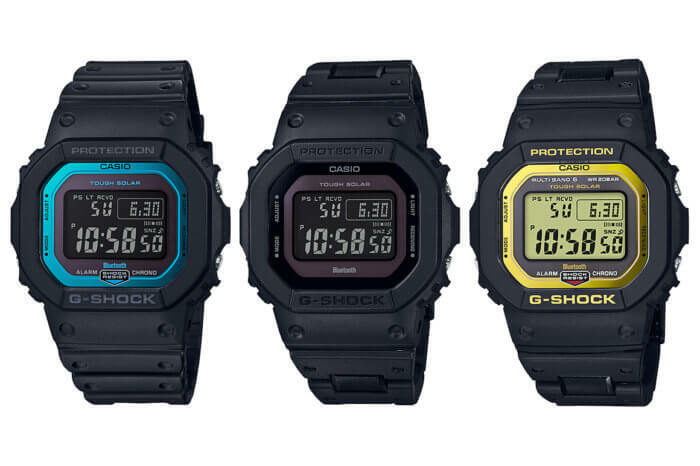 Update: G-Shock Japan officially announced the GW-B5600-2JF, GW-B5600BC-1JF, and GW-B5600BC-1BJF for October 2018 and released updated photos that correct the display alignment and button inconsistency issues of the removed Casio Europe photos. 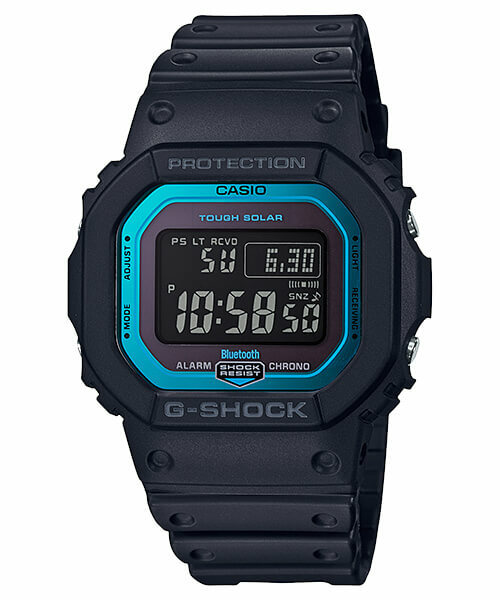 The GW-B5600 models are currently the most affordable G-Shock watches with both Tough Solar power and Bluetooth mobile link, with the next being the GR-B100 Gravitymaster series. The GW-B5600-2, GW-B5600BC-1, and GW-B5600BC-1B are also October 2018 releases in other Asian markets outside of Japan. North America will be getting only the GWB5600BC-1B in November 2018. 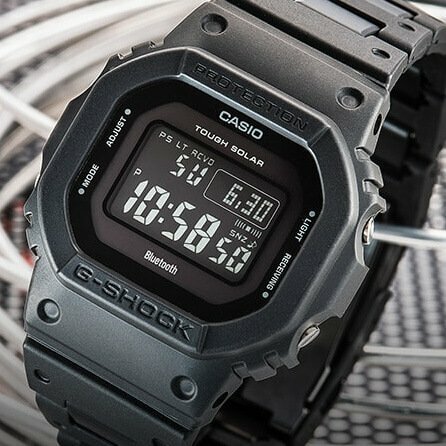 Following the release of the full-metal G-Shock GMW-B5000 watches, there was speculation as to whether a Tough Solar with Bluetooth module would be added to other non-metal 5000-5600 square models. We now have the answer to that question with Casio Europe’s reveal of the new G-Shock GW-B5600 and GW-5600BC watches. 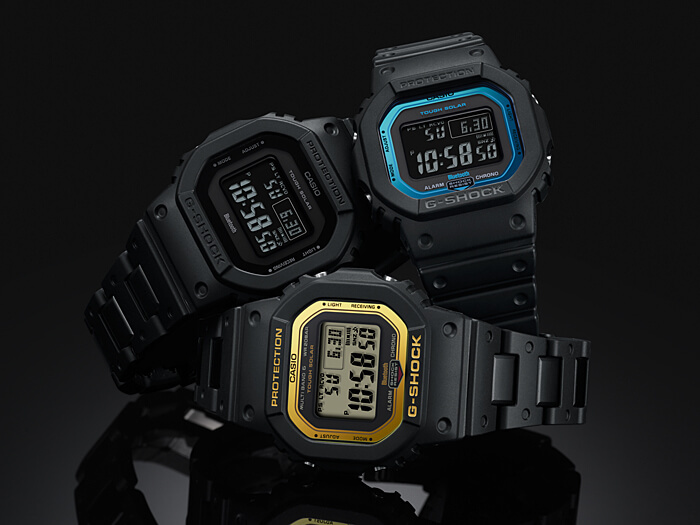 The GW-B5600-2 (black and blue), GW-B5600BC-1B (black), GW-B5600BC-1 (black and yellow) have resin cases. The GW-B5600-2 has a resin band and the GW-B5600BC-1B and GW-B5600BC-1 have a hard composite band made of resin and metal. The blue and yellow borders on the faces of the GW-B5600-2 and GW-B5600BC-1 have a highly relective surface like recent “metallic mirror” models. This gives the GW-B5600BC-1 a gold-like appearance. The module number is 3461 which differs from the GMW-B5000’s 3459 module, though the features appear to be the same. (The instruction manual for the 3461 module is not yet available.) Reader Gary pointed out that the 3461 and 3459 instructions are the same in Japan. The GW-B5600 measures 48.9 x 42.8 x 13.4 mm which is the same as the DW-5600E-1V and a little shorter and narrower than the GMW-B5000. The resin-link band of the GW-B5600BC-1 and GW-B5600BC-1B appears to be similar to other hard “composite” bands we’ve seen on G-Shock watches before but with all resin links with internal metal parts. The metal and resin construction allows for a durable yet lightweight band that is convenient to put on and remove. The fine resin links are said to have a glossy finish. 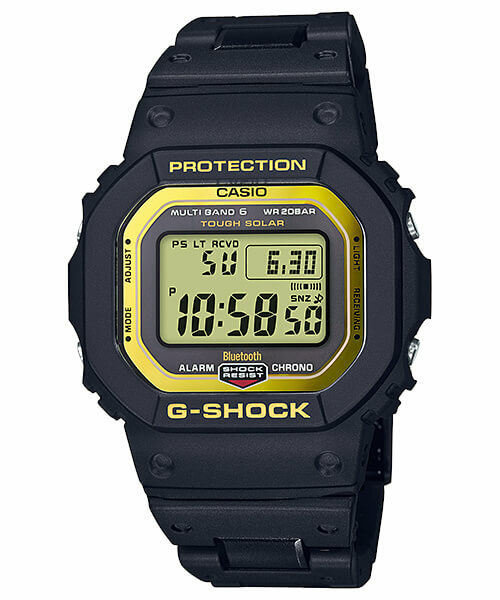 With its Bluetooth connectivity, the GW-B5600 series offers many additional features over the G-Shock GW-M5610-1. These include automatic internet time adjustment (4 times/day), a time & place log, easy watch setting with the G-Shock Connected app (world time setting with 300+ cities, time-swapping, alarms), reminder function with up to 5 reminder alerts, phone finder function, and a battery level indicator with seven levels. It is also possible to set 5 world time cities on the watch and the day of the week abbreviations are available in six languages. 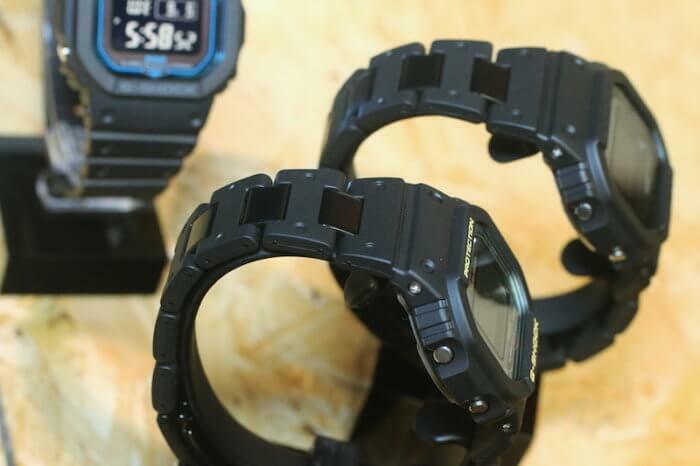 Other features include shock resistance, 200-meter water resistance, Tough Solar power, Multi-Band 6 radio wave time adjustment, world time, 1/100 second stopwatch, countdown timer, 5 daily alarms with 1 snooze alarm, mineral glass, and full auto Super Illuminator LED light, . The dimensions are 48.9 mm x 42.8 x 13.4 mm with a weight of ~53 grams for the GW-B5600-2 and ~85 grams for the GW-B5600BC-1B and GW-B5600BC-1. The European model numbers are GW-B5600-2ER (list price €139 EUR), GW-B5600BC-1BER (list price €199 EUR), and GW-B5600BC-1ER (list price €199 EUR). We expect to see other international releases for these models. Update 2: The GW-B5600-2JF (list price ¥21,000 JPY), GW-B5600BC-1BJF (list price ¥26,000 JPY), GW-B5600BC-1JF (list price ¥26,000 JPY) were revealed at Casio’s Autumn/Winter 2018 G-Shock showcase in Japan and are due for an October 2018 release in Japan. Blue accents with a black resin case and resin band, reverse LCD display. Yellow accents with a black resin case and composite band, standard LCD display. Black resin case and composite band, reverse LCD display. I wait until they fix their production process on these modules. I mean, they can’t even get the models for their promo shots with a straight aligned module. And those shots are the most important ones. Yikes, I just noticed that. Also note how the buttons are differents on each model. Yeah that is very noticeable, but I still think the all-black one looks nice. Casio Europe removed those photos and the new photos have corrected those issues. According to this link, the 3459 and 3461 seem to have the same manual. I wonder why Multiband 6 is not labeled on the first two models. Will these have a screw back case like the full metal 5000’s? The resin link bracelet may be comparable to the tried and true combi but someone else may be better informed on this? With a €139 and €199 list price, I’m guessing they are not screw-backs. Good point on the price indicating the unlikelihood of screw back case. Could Bluetooth connectivity could be added assurance of clock accuracy for those in locations with unreliable Multi-Band 6 radio connection? Any insight on this bracelet compared to the combi? 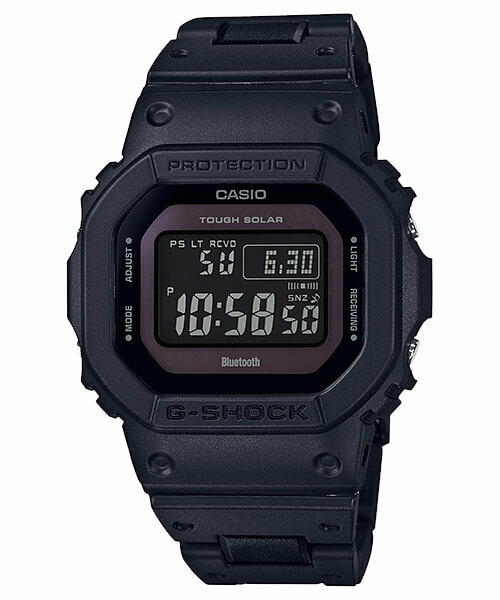 I was about to purchase a GW-M5610BC-1JF as my first an only G-Shock. Are there any advantages to the GW-B5600BC-1B that I am missing? Anyone have any thoughts or advice? I am thinking the GW-M5610BC-1JF is still the better option. Yes, with the Bluetooth feature you can set the watch to automatically adjust the time by connecting to a smartphone. It will automatically connect to the phone 4 times a day to adjust the time and then disconnect. So that is a good feature for people who live out of range from the Multi-Band 6 transmitters. This appears to be a completely new type of band and I don’t have any details on it now, so we will have to wait for more information. The GW-M5610BC-1JF is a fine watch with a nice composite band but if it is your first and only G-Shock you might not want to go with a reverse/negative LCD because it is harder to read than a regular display, especially in low light and at angles. The reverse LCD on the GW-B5600BC-1B could be an STN LCD, which means it would be much better and easier to read than the GW-M5610BC-1JF display, but this hasn’t been confirmed yet. I would wait for the GW-B5600BC-1B. According to the official pages, these do not have STN LCD displays. Thank you for the sage advice. As it turns out the wait won’t be long either. With a premium stamped metal style back and solar charging things should remain water tight; even without the luxury of a screw back case. Maybe even thinner too? The Black model remains truest to the original promo photos which may have steered me from the outset. The Blue version is nice but the Gold looks more interesting. Possibly a pattern instead of solid colour? So many other G-Shock releases coming up but this Black one ticks all the boxes of minimalist basic reliable tactical tool watch on a bracelet. In one of the latest photos the display looks clear from an angle at a distance. Hopefully these won’t sell out right away or command big bucks. That’s the one for me as soon as they come available. . . . and then maybe I can justify needing one of those full metal squares as a necessary option. Thanks again and please keep us posted when these drop. The last picture seems to be for the wrong model (same as the third to last picture). This explains why the 5610s are in sale on Amazon around Europe! Just pre-ordered the all black! Changed it to “Bluetooth mobile link.” Automatic time adjustment (4 times/day), time & place log, easy watch setting, world time setting (300+ cities), reminder function, phone finder function. Hi there, is it the metal band can be replace with another band ? I think to buy the new watch for my first gshock. Thank you so much. You mean change the composite band with soft resin band? Yes I think you should be able to. What is the difference between the Japanese domestic model gw-b5600bc-1jf and the American model? Are there any features that are exclusive to the Japanese model? There is no difference in features. They are the same watch. When you see the JF (or JR for limited editions) suffix like that it just means that the watch is intended for sale in Japan. The watch is the same as the same model number without the JF (such as GW-B5600BC-1 in this case). Other suffixes you might come across are CR, DR, EU, etc. CR and DR mean it’s intended for export outside Japan.